Were our sins atoned for when Christ died on Calvary, which is the view held by the overwhelming majority of Christians? Or does the Bible give us a completely different timeline? Were The Apostles Talking Through Their Collective Hats? The Temple Fills with "Smoke"
From cover to cover of the Bible God makes it amply clear that He hates sin of any kind. So much so that He has long decreed that the wages of sin is death (Romans 6:23). And, since we are all sinners, there is nothing any of us can do to escape the arrow of His wrath that is unwaveringly pointed in our direction. Regardless of whether you agree or not, an idyllic world free from the ravages of all wrong-doing, disease and death is, and always has been, God's ultimate plan for our planet. If you think the Bible is preposterously harsh when it says that even a tiny infraction deserve death, you may never have taken the time to envision a world completely free of any wrong doing (sin). Perhaps you should do so now -HERE. However, at the same time the Father is not sitting somewhere up there swinging His sword of justice, ready to bring it down on our heads every time we step out of line. While He will not tolerate sin, He has provided us with a way to be forgiven, to be reconciled to Him, and live for all eternity in His kingdom. In other words we can be 'saved' from the consequences of our own actions. However, as Hebrews 9:22 tells us, "... without shedding of blood there is no forgiveness". This means He cannot not just let us off the hook so to speak. However, a merciful God does not necessarily demand our blood for our sins. For those who will, He provided a substitute. Atonement, a commonly used Old Testament term, simply means to make amends or reparation for an offense or wrong doing. Although a secondary meaning - to bring into unity or accord - might be considered obsolete in other quarters, it still applies in Christianity. Over and above the many grain and drink offerings in the Old Testament God commanded Israel to set aside one day each year, the tenth day of the seventh month that was called "Yom Kippur" or the 'Day of Atonement". Although there were several different sin offerings made by the individual through the year (ex. Numbers 28), Yom Kippur was the most solemn and important day in the Jewish calendar. As Leviticus 23:28-29 tells us, any person who did not humble himself on Yom Kippur would be cut off from his people. On Yom Kippur an innocent animal, that symbolically bore the punishment for the sins of the nation, was sacrificed - its blood shed as a temporary substitute for the blood of the real offenders and brought reconciliation between God and the people. It was also a graphic reminder that death is the decreed punishment for wrongdoing - without shedding of blood is no forgiveness" (Hebrews 9:22). However, the book of Hebrews also says "it is impossible that the blood of bulls and goats should take away sins" (10:4). So one has to ask what the sacrifice accomplished. In Leviticus 16 (above) atonement has been translated from the Hebrew word kâphar that literally means "to cover (specifically with bitumen)". In fact, this is exactly how in referring to the ark in Genesis 6, God used the word kâphar, when He told Noah to cover the inside and the outside of the ark with pitch. Why Does Scripture Contradict Itself On The Timing of The Atonement? Every Christian I know of assumes that the atonement has already taken place. If asked, they will give you a wide variety of answers to the question of when someone is fully and finally saved. However, those who are actually interested in what the Bible says on the subject - and who are willing to pay close attention to the words the apostles chose to use will run across some extremely confusing statements. Statements that seem to flatly contradict each other. For example, the New Testament sometimes says that salvation is an accomplished reality (past), is an ongoing process (present continuous), and even that it has yet to happen (future). Also note that this seeming contradiction is not limited to salvation alone. It also occurs with bewildering regularity in statements about other crucially important topics - justification, redemption, glorification, and adoption. (Note: The KJV renders this verse as "to us who are saved". However Young's literal translation and many other versions translate this verse as "to us who are being saved ", because it reflects a greater degree of accuracy and faithfulness to the Greek, which has both perishing and saved in the present continuous tense. Vincent's Word Studies also says the Greek reads "being saved: in process of salvation"). Future: However, other verses say we are awaiting redemption. The first quote is by the Savior Himself. And not only this, but also we ourselves, having the first fruits of the Spirit, even we ourselves groan within ourselves, waiting eagerly for our adoption as sons, the redemption of our body. (Romans 8:23). Future: A similar situation arises with the Biblical doctrine of glorification. Past: But just a few lines later we read that we have already been glorified. Future: While Colossians speaks of the "hope of Glory"
Future: And that we are waiting for the hope of righteousness. Seated In the Heavenly Realm. There is one very confusing verse in Ephesians, which projects Christians as already seated with Christ in "heavenly places"
Which again is contradictory. Either we are seated with Him in the heavenly realm OR He is above us, seated with God. Although Ephesians 2:6 cannot be taken literally, it still contradicts Colossians 3:1. The only exception to this mishmash of tenses is with the English words 'reconcile' and 'reconciliation' that were always rendered in the past tense - for good reason. I will, however, come to this later. Most of us in the modern world, entirely used to 30 second 'sound bites', tend to do more glossing over than studying. Thus I have to wonder how many Christians realize that these discrepancies not only exist, but completely contradict virtually everything they have been told about the timing of the atonement. A few who have realized there is a contradiction in tenses have tried to harmonize them with their belief that you are already completely saved. But, as is so often the case, much speaking is used to explain the unexplainable, usually resulting in a totally unconvincing patch up job. Let's get down to brass tacks... an event cannot be both past and future. Either the authors of the New Testament were talking through their collective hats, or what we believe does not entirely square with what the Bible says. So what is the answer? Are we saved now, or not? Can we be assured we have salvation now, or is it something we have to strive and hope for. Have we already been adopted as sons, or are we eagerly waiting for this adoption? Are we righteous now, or is it yet a distant hope? And since it is impossible that Jesus' hand-picked messengers didn't realize or understand what tenses they were using, the answer to each of the above questions is .. BOTH. All three tenses are correct in every instance.. But to properly understand that concept requires a more complete understanding of the atonement. There are two very important fact to bear in mind. Not only was the ritual performed on Yom Kippur prescribed by God Himself, but it was never deviated from in even the slightest regard. 1.) The outer court with an entrance on the East side was as far as the common man could go. 3) The third was the Holiest Place or Holy of Holies was the innermost and most sacred area where God appeared in the cloud over the mercy seat. It was separated from the Holy Place by a large and very ornate curtain or veil. The only person ever allowed behind the veil was the High Priest, and that only once a year on Yom Kippur or the Day Of Atonement. With that in mind, let us take a closer and more diligent look at the actions of the High Priest on the Day of Atonement. Skipping over the ritual washings and prescribed garments etc. which do not particularly relate to the topic at hand (to read the entire account go to Leviticus 16), we are told that Aaron could not offer the sacrifice for the sins of the people until his own sins had been 'covered over'. This meant that he first had to offer the prescribed sacrifice of a bullock for his own sins, followed by the sacrifice of a goat for the sins of the people. An extremely brief summary of the yearly ritual that Aaron followed without the slightest deviation is as follows. He first sacrificed a bullock, then took the blood inside the veil, along with a 'fire pan' of burning coals and two handfuls of finely ground sweet incense. As the cloud of incense or fragrant smoke covered the mercy seat, Aaron took some of the blood of the bull and using his finger, sprinkled it on, and in front of the mercy seat, seven times (Vs.12-14). After this, Aaron went out of the Holy of Holies and slaughtered the goat (the sin offering for the people), then brought its blood inside the veil and repeated the ritual, sprinkling the blood on and in front of the mercy seat (V. 15). In other words each atonement was a two part process. The point being that sacrificing the lamb was not enough. They had to do something with the blood, which was to put it on the two door posts and on the lintel of the houses. If the angel didn't see the blood, the first born died. Since Aaron's God-prescribed ritual had two parts, sacrifice followed by sprinkling, why are we assuming that Jesus' blood shed outside the city and never came anywhere near the Temple (John 19:20) was sufficient to complete the atonement? (Please note that I have quoted the King James version in the first example because it and other literal versions are more true to the original Greek, i.e. Christ's blood is sprinkled. The Greek does not say when, why, or on whom it is sprinkled. See for yourself HERE. Other versions, including the NASB say believers have to be sprinkled. The Greek rhantismos used in the above verses literally means sprinkle. You can say that Jesus' blood on Calvary poured out, dripped, gushed, oozed etc. But, not by any stretch of the imagination was it ever sprinkled much less taken into the Temple. The human high priest of the day was hardly like to have snuck off with a vial of Jesus' blood. And even if he were so inclined, he wouldn't have been able to do much with it because the Ark/Mercy Seat was never present in Herod's Temple. Besides which the human 'high priest' no longer had the authority he once did. Jesus was now the once and forever High-priest..
None of which changes the fact that without the second part of the ritual - the Father's acceptance of the blood sacrifice the atonement is incomplete. I would love to know where Christians get all that. The ONLY thing we are told about the ascension is that Jesus was lifted up into a cloud out of their sight of the disciples (Acts 1:9 NASB) and that after His ascension, He was seated at the right of the Father (Acts 7:56). There is not a single word about finishing His atoning work. So lets not put words into God's mouth. In any case, the author of Hebrews disputes our inventions. Pay attention to the tenses, particularly in verse 24. The "has been" in verse 26 may be a little confusing to some. "Has been" is the perfect tense which, in English, indicates that the action has already been completed. The perfect tense differs from the past tense inasmuch as it focuses on a past action that affects the present. However, in the original Hebrew and Greek, the authors of the Bible often used this tense to indicate a future action as if it were already done. And there is a good reason for this... They knew that when God said something would take place - there wasn't the slightest shadow of a doubt that it would happen. They therefore used the past tense to emphasize the certainty of a future event. In other words, no less than three times in four verses, we are told that Christ appearing before the face of God for us - a second time for salvation will happen in the future. Again the Bible is very clear. Verse 26 specifically says - at the consummation of the ages. The account in Leviticus 16 tells us that on Yom Kippur when Aaron, as High Priest, entered into the presence of God in the Holy of Holies, to atone for the sins of the nation, he not only carried with him the blood which was to be sprinkled on the Mercy Seat, but he also carried a fire-pan full of coals of fire from the altar, and two handfuls of finely ground sweet incense. He put the incense on the fire before the Lord so that the cloud of incense (smoke) covered the mercy seat, (V. 12-13), and doubtless filled the inner temple. What is the significance of the smoke filling the temple at this point? Reconciliation, The Only Word Used Exclusively in The Past Tense. There are two things to be noted about these verses. 1.) Because the Greek katallage was translated 'atonement' in the King James version of Romans 5:11, many people believe that our sins are already completely atoned for, and that this must have happened either on Calvary or after Christ ascended to the Father. Note: The KJV translated katallage into 'reconciliation' the other three times the word was used in the NT (Once in Romans 11:15, and twice in 2 Corinthians 5:18-19). 2.) But, if Christ reconciled us to the Father, doesn't it mean that we are already completely saved? Once again pay attention to the tenses in Romans 5:10-11 (above) - Paul very clearly said having been reconciled, we shall be saved by Christ's life. When Christ paid the price for sin by sacrificing Himself, He made it possible for us to have a relationship with God - He reconciled us with the Father - which made it possible for us to have a compatible and even friendly relationship with Him. However we shall be finally saved when the Father formally accepts Christ's sacrifice. It makes perfect sense that this word is never used in the future tense in the NT. It is well to pay attention to the fact that the Day of Atonement was immediately preceded by the ten Days of Awe, marked by repentance and introspection. These final ten Days of Awe will precede the ending of the age when the doors of salvation will close once and for all. Without repentance and holiness right up to the last day, there will be NO atonement for sin and no salvation. Tragically, the term "saved" is all too often used to mean a salvation that we now have and which cannot be lost. A fantasy that has been fuelled by the clear Calvinistic bias of several popular translations (The NIV and ESV included). In their effort to make sure we understand that the Bible says what they think it says, they translated the Greek arrhabon into 'deposit' or 'guarantee' in several New Testament verses, like Ephesians 1:14, 2 Corinthians 1:22, and 2 Corinthians 5:5. The NET Bible says down payment which is as bad. Arrhabon actually means 'earnest' and is translated so in the KJV. (The NASB renders it 'pledge'). An earnest is something (usually money) given as a token or an assurance of something to come. It shows sincerity of intention.... the person sincerely intended to complete the transaction. It is to be noted that if the person receiving the earnest money fails to complete his part of the bargain, (some modern real estate rules aside) he is usually required to refund it. This is amply illustrated by one event in the Bible that uses the same word. We can argue the meaning all we want, but there is substantial evidence that arrhabon does not mean guarantee. the word has been quite clearly transliterated (The same word written in a different language) from the Hebrew arâbôwn used a mere three times - in the account of the relationship between Judah and Tamar. This is certainly not the most savory of Biblical stories, but the Bible records many incidents that it doesn't necessarily approve of. Judah gave Tamar his seal and staff, as a pledge that he would send her a goat. And when he sent the animal, he fully expected to have his 'earnest' returned. All this fiddling with the text was done in order to convey preconceived ideas that the Holy Spirit will never leave a believer, which means he or she can never be lost. Unknowingly, countless people have relied on these translations, believing that Scripture actually speaks of a guarantee when, in fact, it does no such thing. There is a world of difference between guarantee and earnest. .
See A Deposit “Guaranteeing" Our Inheritance? The Bible telling us that we have been saved, are being saved and will be saved, is not at all contradictory. Regardless of what your denomination, pastor, or school of theology has told you (or even know themselves), the Scriptures are very clear...The salvation process that had its beginning in a watershed moment on Calvary will be concluded in the near future. but in the days of the voice of the seventh angel, when he is about to sound, then the mystery of God is finished, as He preached to His servants the prophets. (Revelation 10:7 NASB) Note: In Scripture, the word "mystery" refers to something that has not yet been revealed. After which Christ reaps the earth (what we call the Rapture). Note: The sole purpose of the Rapture is to get believers out of harm's way while the wrath of God, in the form of the Seven Bowls is poured down on the earth - the final end of all man's kingdoms. Since 'Salvation' and the 'Kingdom of God' are inextricably linked it is hardly surprising that the "Now And Not Yet" scenario applies to both, which is why the Gospel authors also used different tenses when they spoke about the Kingdom. See The Kingdom... when? Footnote I... The "Prophetic Perfect"
One of the most interesting uses of verbs in the Hebrew Old Testament was how future events (prophecies) were spoken of as being in the past. Very often, prophecies about the future were expressed, not in the future tense as we might expect, but in the past or perfect tenses. In other words, the future was described as having already occurred. By doing this the prophets emphasized the certainty of God's word, inasmuch as a future event would occur, without question or doubt. It was as good as done. This idiom familiar to scholars, who often call it the "prophetic perfect" tense, was carried over into the New Testament by the Hebrew authors/prophets. If you think about it, modern English users sometimes use the past tense to indicate that some action is as good as completed. In fact the word "done" is often used in reply to being asked to do something. Numbers 21:34. When Og, the king of Bashan, and his army came out to battle the nation of Israel, God's assured Moses that they would not be defeated in the following words that, interestingly enough, seems to be how most translations render it. These verses in Ephesians have retained the original past tense, which may create some confusion, since there is absolutely no evidence that God has already seated His people with Christ in the "heavenly realm". Perhaps because most Christians have no knowledge of the "prophetic perfect", the average reader would wonder when the Lord came with thousands of His saints. However, the past tense is simply stating that the Lord will come with His saints. Many commentators believe that when Isaiah wrote that "the temple was filling with smoke" (6:4) he was referring to "the cloud" which was the visible symbol of Divinity in the Old Testament. However, Isaiah used the Hebrew word âshân (smoke) not ânân. Also, it is important to note that Isaiah was not allowed to enter the Holy of Holies, a prerogative reserved for the High Priest alone, once a year on Yom Kippur. (In the eighth chapter, verse 2, Isaiah mentions Uriah as being the high priest). Therefore, when the prophet said he saw the "Lord sitting on a throne, lofty and exalted, with the train of His robe filling the temple", he could not have seen the Father in the Holy of Holies. 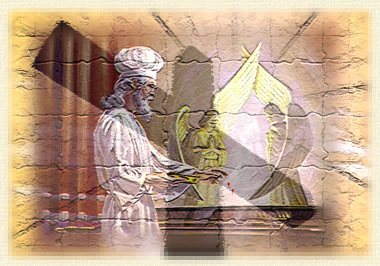 Additionally, the account goes on to say that the angel touched Isaiah's lips with a burning coal (literally, "a hot stone") which he took from the altar with tongs, telling him that his iniquity had been taken away and his sins forgiven (Vs. 5-7). There were only two places in the temple where a fire was kept continuously burning. 2) The fire on the altar of sacrifice in the courtyard was initially kindled by the Father Himself (Leviticus 9:24) and was never allowed to go out. (Leviticus 6: 13-14). (In view of the fact that the angel told the prophet that his sins had been forgiven, it is likely that the hot stone came from the altar of sacrifice). The point being that when Isaiah said "the temple was filling with smoke", he was not referring to the "Holy of Holies " but to the outer courtyard of to the Most Holy Place. The Holy of Holies only filled with smoke on Yom Kippur. Footnote III... Two other Crucial "Mis-translations"
The list is endless... It seems to be glaringly obvious that a pre-bias drove many of the translations. Sadly, in the effort to put forward what they believe to be true, the translators have led people away from what the Scriptures actually say. And since most people cannot speak Hebrew or Greek they rely on these inaccurate translations.